Beach Wedding Orange Beach: A Fall Beach Wedding! If the terms “fall” and “beach wedding” have never seemed to go together, let us change your mind! The fall season is great for weddings, and perfect for a gorgeous beach wedding. 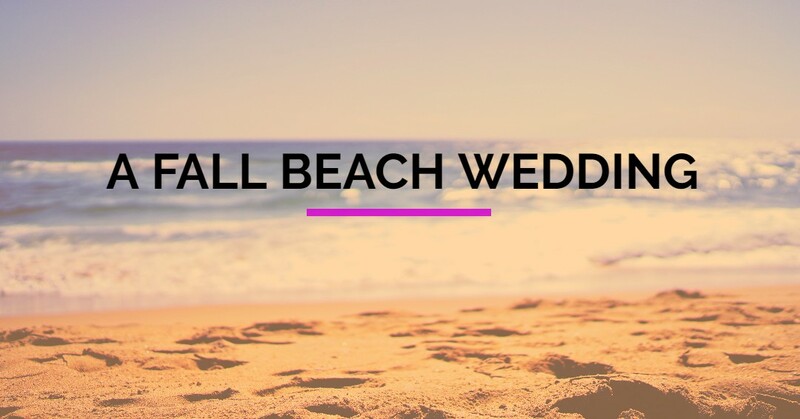 Read on to let us convince you that the fall is the perfect time for your beach wedding! The fall is starting to get cold, right? Not if you are in Orange Beach! The fall season brings some of the most beautiful weather of the year, and the 60 to 80 degree temperatures and bright sunny skies make beach days perfect. While other parts of the country are beginning to feel the first signs of winter, the Alabama gulf coast is cooling down just enough to make the perfect setting for your fall wedding! If you weren’t considering having a fall wedding because of the weather, think again! An Orange Beach wedding gives you great weather for your perfect fall wedding! Fall is the perfect time to get creative with your decor, and incorporate unique elements into your design. While there may not be falling leaves of red, orange, and yellow on the beach, if that is what fall traditionally means to you, work them into your decor! The fall time is a great chance to use moodier colors like rusts, deep reds, forest greens, and ochre yellow. Think outside of the box when it comes to your wedding dress color, or your bridesmaid’s dresses, and see if you can work in hints of fall. Succulents are perfect for the fall, and add a great touch of natural green into any wedding. Plus, succulents can be saved to use as favors, houseplants, or put outside in the garden; they are more long-lasting than traditional flowers. If you want your wedding to feel really special, a fall beach wedding fits the bill. If the weather is beginning to get chilly where you live, the trees bare, and the skies bleak, a beach wedding will be a great escape from your regular life. Your guests will be thrilled to bask in the sun and surf of Orange Beach, and you will feel transported to a tropical paradise. Going from a cold and cloudy landscape to the beauty of the beach will set the stage for your beautiful wedding, and will bring relaxation and happiness to everyone there. Because the fall is so beautiful in Orange Beach, it is also the perfect place for your honeymoon. Eliminate the stress of planning a destination wedding and a separate honeymoon, and stay in Orange Beach to enjoy being newlyweds in one of the most beautiful places in the country. Life is busy, and planning a wedding can be stressful, but when you go with one of the all-inclusive packages from Beach Weddings Alabama, we do the work for you! Make it even easier by staying on the gorgeous gulf coast for your honeymoon! What are you waiting for? It may be turning cold where you live, but the sun is shining, the sea is sparkling, and the sand is still warm down in Orange Beach! Contact us today to start planning your fall beach wedding!